By Night Studios wrote a new set of LARP rules for Vampire: the Masquerade. While I am usually interested in neither LARP nor playing vampires, a good friend of mine (Teylen) is—and she claims this book would make excellent pen and paper rule for contemporary dark fantasy as well. She was kind enough to lend me one of her copies. I never played Vampire: the Masquerade or Mind’s Eye Theatre. That means I lack many of the implicit rules and conventions that were ingrained in active fans over the years, while I harbour some prejudices against Vampire: the Masquerade and Mind’s Eye Theatre in particular. Enough about me, more about the book. First of all, that book is quite a doorstopper: over 500 letter sized pages of mostly pure text, a few figures showing postures expressing certain rules being in effect, and a couple colourful full-page pictures. The layout is not fanciful, but mostly well done. I would welcome markings on the outer margins to quickly find the beginnings of chapters, generally reading the book is easy, but finding something is difficult. The book could definitely be better organised, at several it it mentions rules terms or concepts that had not been explained yet (some core concepts are only explained at p290)—one has to use the index if one stumbles over such an entry. One is greeted by a short-story, describing the Release Party (vampire confirmation) of Sophie, a newly embraced (transformed) vampire. 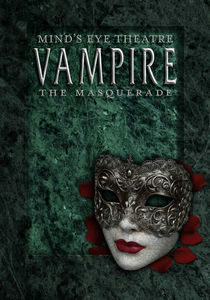 Sophie will accompany one through the whole book, learning about vampire law and lore as one does. Even though I loath the writing style, the story is rather good at creating context for rules and setting alike. Next, a short overview of vampire history, broadly painting the ancient past and becoming more detailed as time moves on. Well done, creating background without overburdening me. (That is done in later chapters, when it is repeated with much more details. Thrice.) Just the last twenty years or so greatly confuse me: According to the description, the Camarilla (a lawful evil vampire empire?) mostly vanquished any opposition and just fielded a powerful standing army, and … does nothing with it. Not even when greatly provoked by an enfeebled opponent. As someone not involved in the game, this confuses me, but I assume those changes were applied to acknowledge changes in player’s preferences without annulling years of previous Vampire Chronicles. Sects seem to constitute the first pillar of Vampire: the Masquerade. There are four sects: Camarilla, Sabbat, Anarchs, and Independents. On the first glance, the Camarilla seems to represent a kind of feudal state with more or less autonomous princes ruling their respective principalities; while the Sabbat resembles a strictly hierarchical Doomsday Cult with a fascist ideology; and the Anarchs appear basically as a rebellious youth movement within the Camarilla. The Independent clans seem to mainly exist to allow players some leeway from the sects, as I find few differences between independent and affiliated clans otherwise. The balance of power between the sects remains a mystery to me. Clans, the second pillar, are very similar to classes in other role playing games as they define basic qualities and weaknesses any member possesses. While player choose a clan, the character does not have this choice: One always belongs to the same clan as the sire (vampire who turned one into a vampire). Generally, the clans are very good matches for roles one might want to play in a contemporary vampire based urban fantasy game (with, of course, a few exceptions). While I do appreciate this part of the clans, the description themselves are a mixed bag. Some clans are highly specialized, others more flexible. Some clans immediately invoke plots and ploys, while others are as inspiring to read as watching the paint dry. Also, clans seem to be either sworn enemies, staunch allies, or completely indifferent. I would prefer some indications in regard to their non-extreme relations with other vampire groups. Oddity: According to the introduction story, vampire that fail the vampire confirmation are killed immediately. Yet, there is a “clan” called Caitiffs that is made up solely of those vampires and they are not killed on sight. Onward to the third pillar, generations. Those are a measurement of power: The primal vampire (generation 0) is also the most powerful one, the further removed from this source, the less powerful the vampire. If one somehow succeeds in diablerie (devours another vampires “heart”), one draws nearer the primal vampire and thus increases in power as one decreases in generations. A vampire to far removed from the primal vampire basically remains a human with some vampiric traits. One cannot exceed generation 6 according to the rules, standard player vampires start in generation 11. The baseline for all skills seems to be “what we could do when we played Vampire: the Masquerade for the first time back in the late 1980s and early 1990s”. Otherwise, I cannot explain why everyone easily handles a car at 100 km/h, while using a smartphone or a ticket machine requires computer skills. Why do low generation vampires have problems adapting to computers, but not problems adopting to modern science (which greatly depends on computers)? We learn Newton’s Mechanics, the epitome of 17th century scientific progress, in Secondary School nowadays—does that mean each modern human is skilled in Science: Physics? The peculiarities do not end here though. If one improves driving, one does not only learn to drive better, but also to drive more kinds of vehicles. If one wants to become a pharmacist on the other hand, according to Fields of Study on p92, one needs to buy ranks in Science: Biology and Science: Chemistry, instead of simply studying pharmacy or biochemistry. The oddity seems to run along a fault line of how frequently the skill is used in a chronicle: Frequently used skills like lore and driving are written according to the demands of the game, while rarely used skills like Academics, Science and Performance are more convoluted, as if tacked on as an afterthought. It might have been useful to limit the available disciplines for this skills to four or five broad categories; if one wants to purchase more than one rank one has to specialise, ranks above the first only apply to that specialisation. I like the way how they handle resources, they found a way to deny a player access to their resources without invalidating the purchased resource ranks: If a player loses access to a resource, it is “automatically” restored after a certain amount of time (or rather, the player does not have to pay for regaining access after that period). Disciplines and techniques are supernatural powers that allow vampires for example to turn into a wolf or mesmerise a mortal. While inspiringly written, also very difficult to understand as many rules are hidden in prose. I would also welcome an overview of all disciplines with a short (technical) description and page references. Merits and Flaws are a mixed bag. Most work rather well, offering a choice between a one-time boon at the cost of permanent penalties, but some (e.g. Notorious or Thirst for Innocence) are extremely vague and depend solely on the storyteller’s memory. I am not quite sure how well Derangements work during play, I am a bit suspicious they might be either disruptive or purposeless. The rules itself are rather slim: You play rock-paper-scissors against either the storyteller or another player. If you win, you succeed. If you lose, you fail. If you tie, the involved characters compare their pools. Under certain circumstances (i.e. high discrepancy in power or use of willpower), the loser may ask for a rematch. At the table, one could easily replace “rock-paper-scissors” by rolling a d3 each, but there are also specific props for LARP (Teylen introduces three of them in her [German] article on rock-paper-scissors in role-playing games). The rules assume small conflicts, with probably not more than four or five participants in any given conflict. That is probably owed to the higher interaction between players on a LARP, that require less input from a storyteller compared to pen-and-paper games. The Mass Combat rules allow to scale conflicts to an appropriate level for the average pen-and-paper group, even though the system probably begin to fall apart if any party outnumbers the other by 4 to 1 or higher. Beside conflicts, Feeding (with the danger of blood bonds) and Humanity are key mechanics in Vampire: the Masquerade. Feeding is rather simple, you need to obtain a certain amount of blood points each period. The rules encourage to feed between sessions, and concentrates on handling this abstractly. Feeding should be only included within a session if it could result in dramatic tension like establishing a blood bond (more or less a total addiction to another vampire). The rules support this playing style well, by giving rules to measure feeding abstractly and quickly. Humanity is meant to be the core mechanic for Vampire: the Masquerade. It basically measures how much you, as a human player, control your character and how much the beast, the monster within every vampire, dominates you. Those rules are horribly broken, as the authors themselves state: If used as written, most characters would permanently turn into a raging monster after a single adventure. And, indeed, if you do anything but working as home office accountant and meeting your vampire pals after work to lament the tragedy of your existence, that is most likely going to happen. (Which confirms one of my prejudices against Vampire: the Masquerade). As written, the rules are a pure method of punishment for characters that behave adventurously and require ever vigilant storytellers to be enforced. They are meant to display a constant struggle between beast and human, but they are unable to invoke this kind of feeling in a player. I am rather certain that even the Dark Power checks from Ravenloft do a better job in this regard, as they offer short-term advantages for the price of long-term costs. There are also rules for status and influence, which allow you to gain mechanical benefits for achieving a specific status or being well connected to a group. They seem a good match for LARP games and most can probably be transferred to pen-and-paper games as well. Strangely enough, I agree with most of the GM advise as well—despite the comparison with Shakespeare’s plays. They stress how important player agency is for a game and give excellent advise how to include other player into a player’s goals instead of solving them solely between storyteller and player. My opinions on metagaming greatly differs, but otherwise I could find common grounds with a storyteller following these guidelines. Last but not least, the book offers rules for couple non-vampires to integrated as antagonists, enemies and allies under control of the storyteller, including rules how to adapt them. That is more of a construction set than a selection of ready to use characters. There is much I dislike about this book: It is horribly organized, one needs to read the whole book in one go to get a grasp on the concept. Information is often scattered over several chapters, requiring one to slug through repetitions to find the passage one is looking for. All this is made worse by the fact that many parts are written as prose instead of technical instructions. Finally, with over 500 letter sized pages it is rather unwieldy. Yet, Vampire: the Masquerade offers immense flavour and an alluring setting. After reading this book, I understand why it attracted such a large crowd. Rules and storyteller advise are sound, both obviously deeply rooted in gaming practice and an eye for what works and what does not work. I might even try some of the mechanics in my own games. Even though I will never understand what exactly makes playing a vampire appealing—it seems to be very similar to working as an official in administration or management—I could imagine playing in the World of Darkness with the rules presented in this book. Dieser Beitrag wurde am 22. Januar 2016 von belchion in Rollenspiel veröffentlicht. Schlagworte: Rezension, vampire.